KANE has experience in the special logistics requirements of major retailers and their suppliers. Our systems are highly flexible and can easily adapt to your retail processes and systems, and help you manage seasonal volume swings economically. For mid-sized CPG companies, working with a 3PL like KANE can give you more clout with a retailer than you might have on your own. We likely already work with that retailer through the multiple CPG manufacturers that we serve. We also know how to help you walk the tightrope between providing sufficient service levels to retailers while satisfying their appetite for lean inventory and keeping costs low. KANE's award-winning cross docking solution enables retailers to avoid many of the costs of traditional warehousing and distribution. Suppliers ship to the KANE cross dock within established time windows and KANE coordinates store-direct shipments of multi-vendor truckloads within 24 hours of receipt. Why KANE for Retail Logistics Services? KANE is a 2-time winner of Sam’s Club’s 3PL of the Year award, a multiple winner of Walmart’s Carrier of the Year honor, and has won the Sam’s Club Distribution Center of the Year Award for 10 of the past 16 years. Our KANE-operated facilities continue to rank among the highest in our operational index. In 1990, KANE developed a cross-docking solution for Sam’s to receive product from vendors, make it “store-ready” through consolidation and deliver it to stores − all within 24 hours. The solution leverages KANE’s transportation management service and effectively eliminated warehouse storage costs. The relationships with Sam’s and Walmart has continued since then, with KANE assuming the operation of several more cross dock facilities. KANE been named Walmart’s Carrier of the Year twice in the past and has won the Sam’s Club Distribution Center of the Year Award for 10 of the past 16 years. KANE is the only 3PL to be named Sam’s Club 3PL Partner of the Year for two consecutive years. Most product marketers these days sell online, and Nutrabolt sports nutrition supplements are no exception. KANE manages B2B and B2C shipping requirements for Nutrabolt out of multiple facilities. Warehouses are a critical component of logistics operations, but sometimes it’s best to keep products moving. With the right set of supply chain characteristics, companies can leverage a cross dock strategy to speed factory-to-store-shelf cycle time and reduce distribution costs up to 50%. 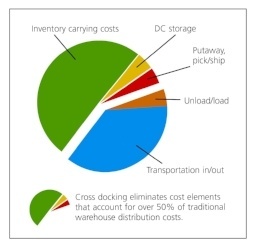 The accompanying graphic shows that savings derive primarily from freight and inventory carrying costs. In a typical cross dock, items arrive from dozens, even hundreds, of retail suppliers and, after a brief stop off, go directly to the store. Reduce distribution costs by more than 50% on the items being cross docked. Reduce facility operating costs. Cross dock facilities are smaller and simply cost less to operate than full-fledged distribution centers. Reduce inventory. When the volume and timing of supply can be managed to precisely match demand, the need for large safety stocks is eliminated. Reduce transportation costs. Transport mode shifts from high-cost LTL to consolidated truckload shipments that get there faster. Increase retailer efficiency. Retailers receive fewer, precisely timed shipments, requiring fewer dock doors and receiving staff. Cross docking is a proven retail strategy, but many retailers don’t use it because, frankly, it’s hard. You need tight planning and coordination among manufacturers, carriers and 3PL partners, as well as the systems to synchronize inbound and outbound flows.